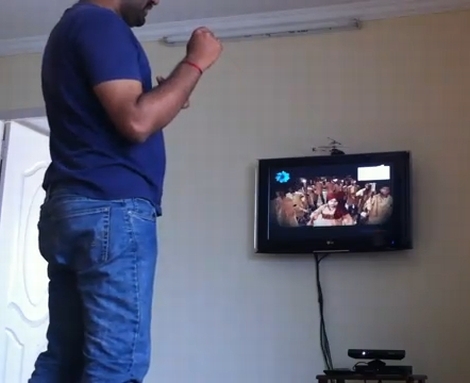 [Harishankar] has posted a video on his blog demonstrating the ability to control devices using the Microsoft Kinect sensor via IR. While controlling devices with Kinect is nothing new, he is doing something a little different than you have seen before. The Kinect directly interfaces with his Mac Mini and tracks his movements via OpenNI. These movements are then compared to a list of predefined gestures, which have been mapped to specific IR functions for controlling his home theater. Once the gestures have been acknowledged, they are then relayed from the Mac via a USB-UIRT to various home theater components. While there are not a lot of details fleshed out in the blog post, [Harishankar] says he will gladly forward his code to you if you request it via email. Thanks to [Peter] for the tip. not sure if its just me, but that TV seems a little too small for it be wall-mount-worthy… atleast put something else on that wall, it looks terrible. Times must be tough in the Harishankar house, rocking the 20 inch there looks like. Does it change the channel when you give it the finger? That would be perfect for election time. Hi, thanks for sharing my video. Meanwhile, It’s a 32 inch TV which is good enough for someone who never watches tv. Meanwhile it’s a rented house, so drillIng needs some special permission. Am using skeleton detection with OpenNI and then detecting gestures on my own. You can check the code in my github repository. It seems very buggy and unresponsive. We invented remote controls for a reason, gestures to change channels and volume seems to be an overkill. I like the idea of giving the finger when I don’t like a channel or program though. ITT: Hurr Durr, look at the size of his screen. My pen…. SCREEN is massiver! I can change the channel on my tv using just my thumb, and without leaving the sofa. This is very next-thing. I want to use hand signs to control realtime multimedia in theater ops. Curwin 1850 thereabouts had signs for the seven-tone scale, able to be taught to anyone. Even aliens are taught in Close Encounters. As the volume war rages in earbuds and deafness sets in earlier, signing by hand will become second nature. Man or machine, it won’t matter. And there is nothing to break or get lost in the sofa. But, this makes big brother’s eye see very clearly. Scary stuff Kinect and Windows 8. Gabe I think it’s really interesting. It may not have a use to many people but this is an area worth exploring, if just for the fun of it. Thanks for sharing! However, mounting a small TV on your wall is *not* a “home theater”. This term gets slapped on anything with a display or speakers anymore. Just call it what it is…a TV. Of course the prototype is awkward, that’s to be expected, but it also doesn’t need to be totally, 100% perfect. I don’t know about you guys but about 1/6 the time I use a normal remote I screw up a digit or the dog walks in front of the beam or something. The kinect just has to do better than that. And just imagine if he could get that thing to consistently interpret sign language. isaul32 liked A Programable Breadborad.